Kpreps Game Day feature is designed to provide you with a program for things to watch out for each week in Kansas High School Football. If you have suggestions for what you would like to see in future Game Day features, send us a message on Twitter or Facebook. Alex McMillian first came to Madison after the 2015 season, a year where the tradition-laden Bulldogs finished 2-7 and permitted 41.3 points a contest. McMillian had served a successful assistant coach on Victoria’s state teams in ’14 and ’15. He wanted to improve Madison’s competitiveness. In ’16, Madison bumped to 3-6 and allowed 40.2 points a game. Last year, the Bulldogs opened 4-0 but had trouble in a district with West Elk, St. Paul and Sedan and finished 5-4. Madison had a drop in defense to 29.1 points allowed. This fall, the Bulldogs have not permitted a point. Madison shut out Marais des Cygnes, 50-0, then earned a marquee win at Waverly, 20-0, and rolled Hartford, 76-0, last week. It marked the first time Waverly had suffered a shutout since 2013 and just the second occasion since the 2009 season opener. Madison is the only eight-man team that has not allowed a point this year. As well, 6A Lawrence Free State, 5A Maize, 3A Scott City and 1A Jackson Heights have opened with three shutouts. FS, Maize and SC are all ranked. This Friday, Madison travels to surprising Maranatha Academy in the District 3 opener for both squads. In a rarity, it matches the No. 1 offense against the No. 1 defense. Maranatha, in its first year of eight-man football, has scored 212 points. They are the only team in Kansas to exceed 200 points. The Eagles defeated KC East Christian (Mo. ), 72-22, won at Altoona-Midway, 74-14, and beat Colony-Crest at home, 66-0. Bryan Burdette, the coach since 2013, has led the Eagles to its best start since his first year, a season where Maranatha mainly played Missouri schools. Three of the first four games came against Missouri junior varsity schools, according to Kansas Football History. Junior Nate Burdette has thrown for 371 yards with a 13/1 TD/INT ratio, and rushed 21 times for 184 yards and four scores. He has multiple tall wide receivers. “Offensively, they are very good, so it’s definitely going to be a challenge on the back end of our defense,” McMillian said. Each Thursday at 5:45 p.m., Madison has its pride run when the coaches take the team downtown. Around 50 community members show up and the coaches hand out team pride stickers. McMillian requires at least 30 minutes of film to attend the pride run. McMillian said normally half the team is over the two, three hours. Against Waverly, Madison watched extensive film and studied tendencies. The Bulldogs, playing in the mud, recovered three fumbles. Overall, Madison has 11 forced turnovers, including two from junior cornerback Nasun Wasson and senior safety Austin Watts. Wasson and Watts are part of a deep group at running back. McMillian runs the same 3-2 that longtime Madison coach Fred McClain, now the junior high coach, used. Sophomores Chase Harrison and Hunter Engle start at defensive end. Freshman Drew Stutesman has played on the defensive line, and senior Davin Stutesman starts on the offensive line. Engle had a standout freshman year with 78 tackles. Junior Sebastian Bolinger and sophomore Joseph Stubbs play nose. Seniors Duke Beyer and Dylan Maltbie play linebacker, and junior Colton Fife is at corner. Blue Valley visits Rockhurst (Mo.) – Blue Valley, ranked third in Class 6A, makes the short trip across the state line to take on Missouri-power Rockhurst. The Hawklets are ranked No. 6 in Missouri Class 6 and have won three straight since a season opening loss to Columbia Rock Bridge. Rockhurst will begin a two-game venture into the Eastern Kansas League as they will travel to Bishop Miege next week. Olathe North travels to Columbine (Colo.) – Olathe North travels to the Denver area to take on Columbine High school. The Eagles are ranked No. 4 in the Kpreps Class 6A poll and have been led on the ground all season by senior Daymonn Sanchez and sophomore Arland Bruce, IV. Columbine is 4-0 on the season and ranked No. 3 in Class 5A – Colorado’s largest classification. Ell-Saline (2-1) at Sedgwick (3-0) - Battle of the Cardinals and feature quarterbacks Nick Davenport (Ell-Saline) and Hooper Schroeder (Segdwick). Olpe (3-0) at Jackson Heights (3-0) - See our Kpreps Game of the Week article. This should be a great one between two stingy defenses. Olpe has allowed 8 points all season, while Jackson Heights has allowed none. 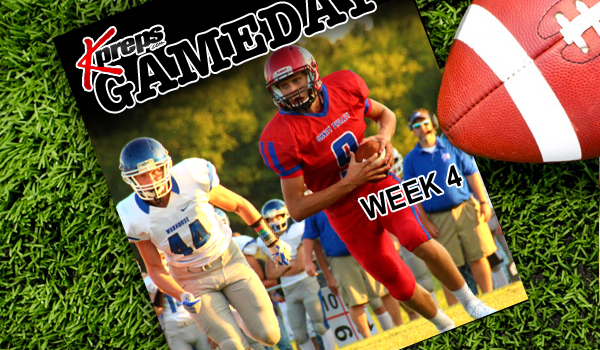 Smith Center (2-1) at Plainville (2-1) - Mid-Continent League rivals seem to meet twice each year. This may be no exception as these are two of the best teams on the west side of 1A. St. Mary’s Colgan (3-0) at Centralia (1-2) - Rematch of a great playoff game last season won by Colgan, 25-18. These two sets of Panthers are meeting in the regular season for the first time, but don't be surprised if you don't see them again for another playoff classic. Shawnee Mission North at Olathe West – The Owls have a chance for their first varsity football win in school history. Senior quarterback Zac Krause has passed for 463 yards and four touchdowns and added two rushing scores for the Owls. Caney Valley at Columbus – This may be an elimination game in Class 3A, District 1. Both the Bullpups and Titans are traditional playoff contenders, are in a loaded district that includes Galena, Frontenac, and an explosive upstart Parsons team. That means the winner of tonight’s matchup in Columbus may have the inside track into the final playoff spot in District 1. Girard at Burlington – This one should go a long way in deciding the Class 3A District 2 title. Both the Trojans and Wildcats, along with Prairie View, are the teams expected to secure the top three playoff spots out of this district. Girard and Burlington have split meetings in the last four years with Burlington winning the last two years. Sabetha at Marysville – The Bluejays and Bulldogs meet to open district play this season after meeting in the Class 3A state title game last fall. Sabetha won that game 7-6, stopping Marysville late scoring attempt with an interception at the goal line. Several key players graduated for Marysville, while Sabetha returns a solid nucleus from that last year’s title team and has won ten straight games. Hesston at Smoky Valley – This is an intriguing matchup in Class 3A, District 5. Hesston may be the most talented team in this district when healthy. But the Swathers have been without senior quarterback Cameron Cox due to an injury in the preseason, and all-state running back Parker Roth missed last week’s game due to concussion protocol. Without its offensive stars, the Swathers were handled by Pratt, 55-0. Tonight’s game at Lindsborg becomes key given the depth of this district including Halstead and surprising Chapman. Hutchinson Trinity at Conway Springs – The Celtics and Cardinals are part of a loaded 2A District 6 that includes four unbeaten teams and three teams ranked in the top five in the state. Hutchinson Trinity is unbeaten, but the Celtics will travel to Conway Springs with an opportunity to prove they belong in the upper-echelon of this district against the Central Plains League teams. Argonia-Attica (3-0) at Caldwell (3-0) – Titans & Blue Jays are part of loaded District 2 where five good teams will battle for four playoffs spots. Bennington (2-1) at Canton-Galva (2-1) – This one will likely decide who finishes second and third in 8M-I, District 4. Central Plains (3-0) at Little River (3-0) – Oilers’ skill athletes against the size up front of Little River with the winner likely claiming the District 5 title. Clifton-Clyde (3-0) at Hill City (2-1) – Can you say points? Clifton-Clyde is averaging nearly 57 points per game, while Hill City is averaging 59. Kiowa County (3-0) at Hodgeman County (3-0) – Hodgeman County faces an unbeaten opponent for a fourth straight week – can Kiowa County make a statement? Doniphan West (0-3) at Onaga (0-3) – This one likely decides the fourth playoff spot in 8M-II, District 3. Otis-Bison (2-1) at Satanta (2-1) – Ultimately, these two teams should qualify for the postseason out of 8M-II, District 8. Otis-Bison can all but secure the title with a win.